(SPOT.ph) Oh, to live the life of a goddess...if only reality didn't get in the way of your #LifeGoals. If it were up to you, you'd be dressed in a swanky satin robe while luxuriating in your plush chamber and enjoying a hand and foot spa. 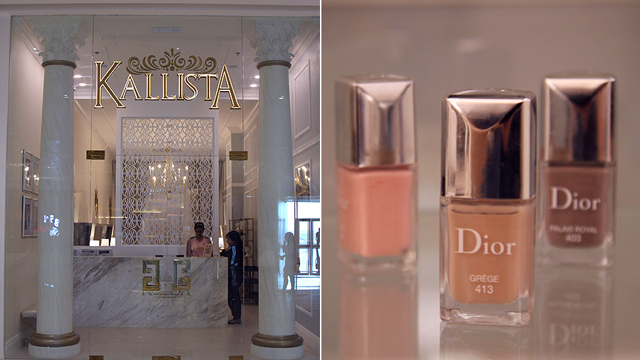 Well, Kallista Nail and Pamper Lounge is here to turn your fantasy into reality. 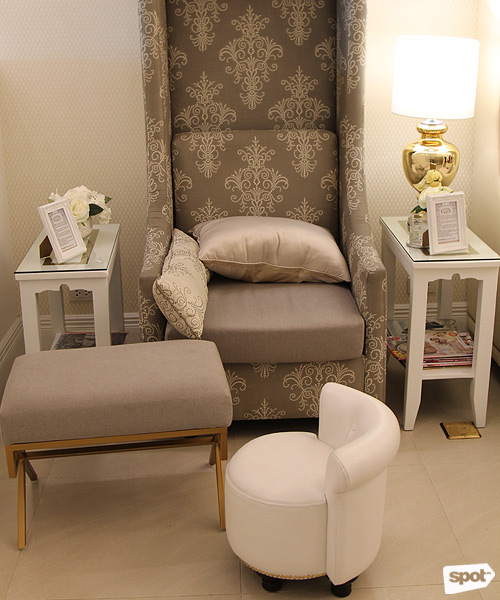 Located on the second floor of S Maison is a little sanctuary where you can take a break from the real world and revel in relaxation as you're treated like the true goddess that you are. 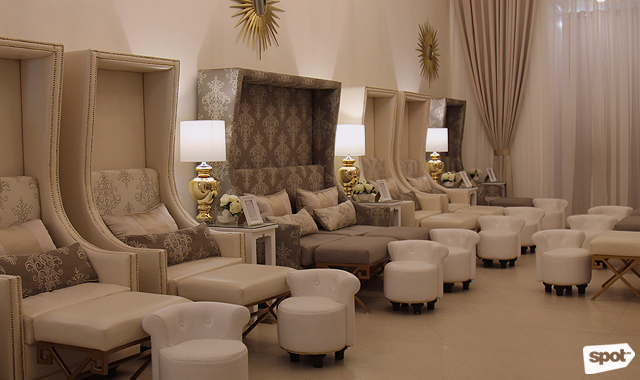 From its posh facade, you can already tell what you can expect from the nail salon—a nice, quiet, and relaxing getaway from life's hustle and bustle. But Kallista goes way beyond your expectations. Enter and you'll find your dream bedroom (you didn't even know you had a dream bedroom, until now). 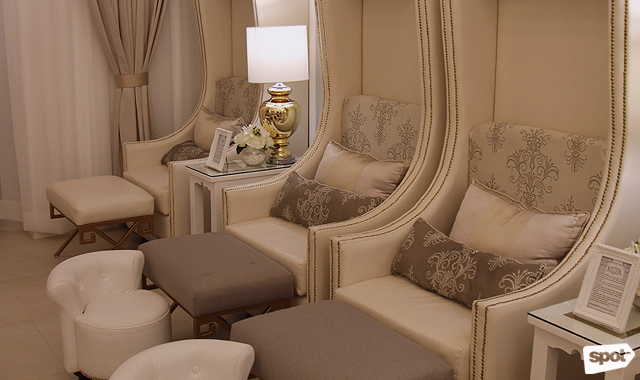 The 70-square meter space has beautiful white-and-gold interiors, a cream and gray color scheme, and plush seats are so Instagram-worthy, you'll be tempted to snap a photo before even deciding what treatment to get! But first, let the lady at the front desk to greet you with, "Kalimera!" which means "Good day!" in Greek. 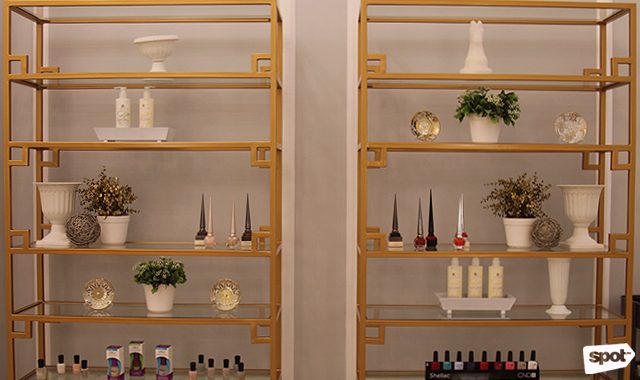 After choosing your treatment, you will be led into the salon where you will easily spot the shelf that showcases their high-end polishes from Dolce & Gabbana, Dior, YSL, and Christian Loubotin. Slip into their golden flipflops and maybe even change into a robe for the ultimate goddess experience! A complimentary beverage, a comfy blanket, and an eye mask will be brought to your seat. Let the pampering begin! 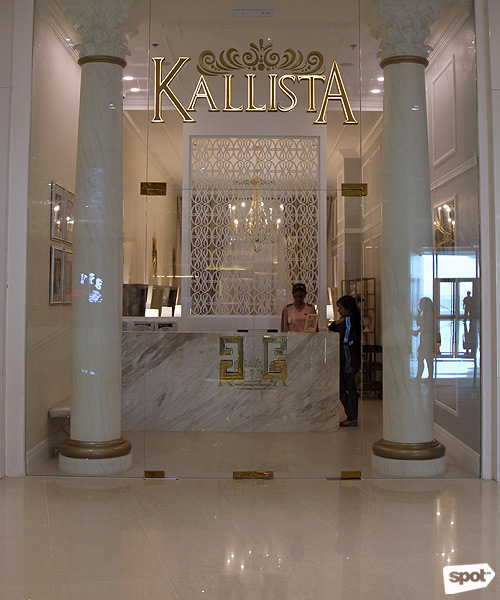 The Kallista Signature (P435/hands, P715/feet) is a 60-minute treatment which includes a hand spa, scrub, manicure, massage, and polish, and a 90-minute therapy of foot spa, scrub, pedicure, massage and basic polish for the feet. If you want to rejuvinate your skin, choose the Goddess Glow (P875 to P1,000). 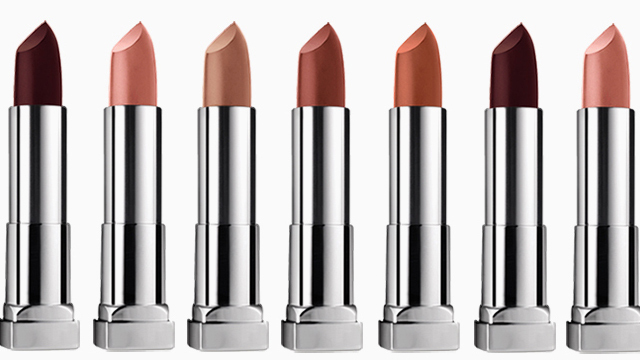 The treatment makes skin feel soft, smooth, and silky. It includes a hand spa, scrub, mask, manicure, massage, and basic polish procedure for 60 minutes, along with a foot spa, scrub, mask, pedicure, massage, and basic polish for 90 minutes. The ultimate Kallista experience is Aphrodite's Ritual (P2,300)—a 120-minute treatment that includes a hand and foot spa, scrub for hands and feet, paraffin dip for hands and feet, manicure, pedicure, and hand and feet massage. Your main man can experience the royal treatment, too! The Hermes Treatment (P1,500) is a 90-minute session that includes a foot spa, scrub, pedicure, 20-minute paraffin dip, 10-minute massage, and basic polish. Apart from those treatments, you can also try their other services like Hera’s Remedy (P1,250), a treatment for a variety of skin conditions affecting the feet, or the Kallista Feet Retreat (P750), a relaxing 60-minute session of shiatsu and foot reflexology. There's also the Helen’s Detox (P875 to P1,050) which makes use of nature-based anti-oxidant-rich products to pamper hands and feet, leaving them feeling minty-fresh and irresistibly soft. Kallista takes pride in their top-quality services. The best part is knowing that the concept is totally homegrown! Apart from the wonderful ambience, it's the warmth and hospitality of attendants and staff that make the nail salon an easy standout. Trust us, the Kallista experience is something you will constantly look for and never forget. 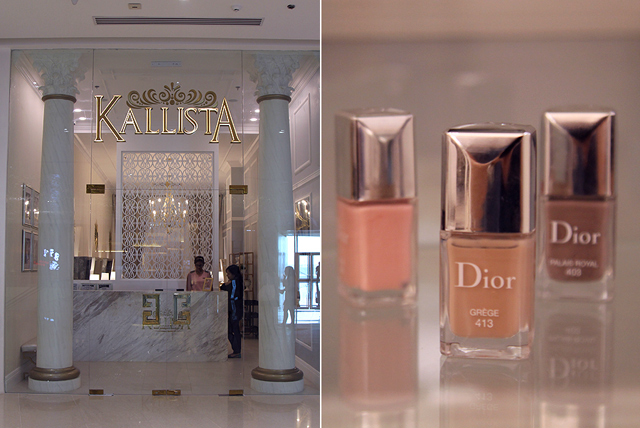 Kallista Nail Pamper Lounge is at the 2/F S Maison, Conrad Hotel Manila, Pasay City.